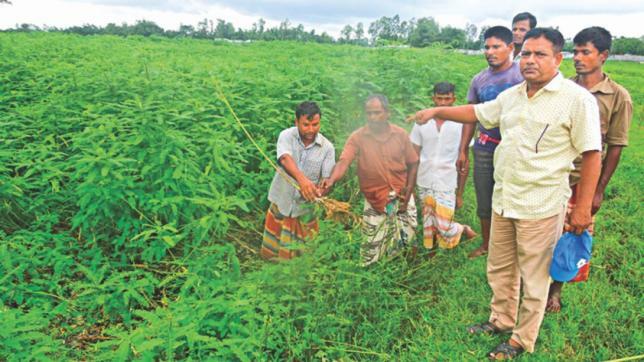 Desk Report: Farmers in Sonarai village in Domar upazila are gradually adopting an environment-friendly procedure to enrich their farmland for a better yield of crops by growing dhaincha, a green bushy plant, reports Daily Star. Thanks to the officials of Bangladesh Agriculture Development Corporation (BADC) for motivating farmers to leave excessive dependence on chemical fertilisers as their regular use reduces fertility of soil. Every year, BADC’s foundation potato seed producing farm, at the village grows dhaincha (scientific name sesvania) on its 320 acres of land to boost crop production, which also helps local growers get an idea of producing green manure. Besides, the farm authorities also promote their contacted potato seed growers to cultivate dhaincha plant during the off period between April to August by providing seeds and other technical support free of cost. During a recent visit to the village this correspondent saw there is rarely any house yard where dhaincha is not cultivated. The plant needs nearly two months for its growth. As the plants grow four to five feet, farmers mix the plant with the soil through ploughing and it turns into green manure. “As the villagers use an earthen road through the BADC farm to go to the upazila headquarters they can see how farm workers are producing the green manure from dhaincha plants,” said Sonarai UP Chairman Abul Kalam Azad.